The International Space Weather Camp (ISWC) is an opportunity for students from South Africa, USA, Italy and Germany to learn about space weather, a relatively new and exciting field involving the study of the Sun and its influence on space and the Earth’s upper atmosphere as well as the impacts of solar events on space and ground based technological systems that modern society rely on daily. ISWC will consist of a series of lectures, hands-on projects and other interesting activities. The Camp covers various aspects related to Space Weather, including cosmic ray particle transport theory, plasma physics, solar physics, heliospheric physics, computer simulations for modelling and understanding local Space Weather, and the impact on Earth’s atmosphere, satellites, and space. 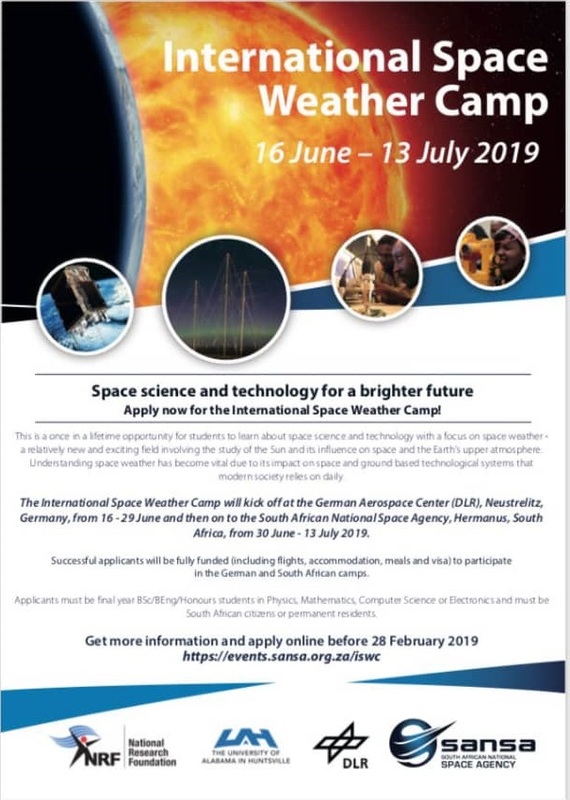 The International Space Weather Camp will kick off at the German Aerospace Center (DLR), Neustrelitz Germany, from 16-29 June and then on to the South African National Space Agency, Hermanus, South Africa, from 30 June – 13 July 2019. Successful applicants will be fully funded including flights, accommodation, meals and visas to participate in the German and South African camps. ISWC offers students a great platform to interact and engage with other students and researchers from around the world. During the ISWC, students will also get an opportunity to learn about other cultures as well as historic developments of space activities in SA and Germany. Initially the ISWC (formerly JSWSC, Joint Space Weather Summer Camp) was a partnership between DLR, University of Rostock and University of Alabama in Huntsville (UAHuntsville). The collaboration was extended in 2015 with SANSA joining DLR and University of Alabama Huntsville in participating and hosting in a trilateral arrangement. Applicants must be final year BSc/BEng/Honours or Masters Students in Physics, Mathematics, Computer Science or Electronics and must be South African citizens or permanent residents. 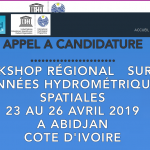 Applicants must have a passport or be able to present proof that they have applied for one as this application includes international travel to Germany. Successful applicants will be fully funded to participate in the German part of the ISWC programme. Funding will include transport, accommodation, meals, and German visa. Application is now open and closes on the 28 February, 2019. Any ISWC queries should be send to iswc@sansa.org.za.